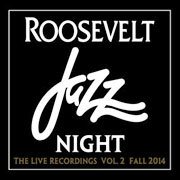 Roosevelt Jazz Boosters is pleased to offer some of the best high school jazz recordings in the country. Roosevelt High School, under the leadership of Scott Brown, has a remarkable legacy of outstanding, award winning jazz bands. Linked below you will find classic Roosevelt recordings from past years as well as the unique Nutcracker Series, a Seattle tradition played yearly to appreciative holiday crowds. You can also hear the band on your favorite music service. Proceeds go to Roosevelt Jazz Boosters – an organization of parents and educators dedicated to bringing the sophistication and discipline of an unparalleled Jazz Education to the students of Roosevelt High School. All proceeds are earmarked for the betterment of our students and their learning experience. We hope you enjoy the recordings and that you come back for more each year. It is our pleasure to bring you the best of America’s high school jazz training programs.